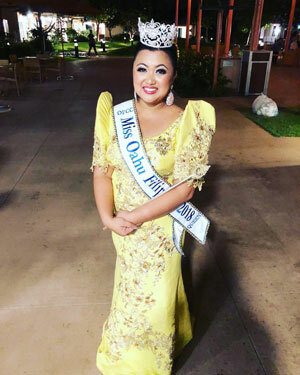 Miss Oahu Filipina 2018 is Maricelle Redona, is Oahu Filipino Community Council Queen voted annually thru it’s Miss Oahu Filipina Scholarship Pageant. The purpose of the Oahu Filipino Community Council is to promote unity in the Filipino community and beyond. The Miss Oahu Scholarship Pageant is a cultural Pageant based on the island of Oahu in the State of Hawaii. Its mission is founded on perpetuating traditions and heritage of the Philippines and its people thru the Filipina women living in Honolulu Hawaii.